Many smartphones, HDTVs, PDAs, tablets, and computer screens now come with an automatic brightness control that aims to conserve power as well as to make the display easier to see in a broad range of illumination conditions. This feature basically dims the display screen in a dark environment and brightens it when the ambient light level is higher. The brighter screen helps to counteract the effects of glare from ambient light and also takes into account for the decreased sensitivity of human eyes to brightness as the ambient light level increases. An automatic brightness adjustment is basically a closed loop system that has the capability to assess ambient light and adjust the brightness of the display accordingly. In our project, a general purpose LDR and a fixed value resistor (10K) are connected in series between the power supply and ground pins to create a voltage dividing network, as shown in the circuit diagram below. The resistance of a typical LDR is less than 1 K? under bright lighting condition. Its resistance could go up to several hundred K? under extremely dark condition. Therefore, the voltage across the 10K resistor increases proportionally with the surrounding illumination. For the given setup, the voltage across the 10K resistor can vary from 0.1V (under dark condition) to over 4.0V (under very bright illumination). 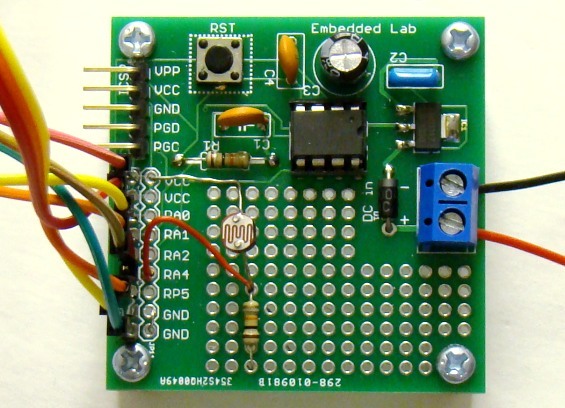 The PIC12F683 microcontroller reads this analog voltage through its AN3 (GP4) ADC channel and then sends out appropriate signals to the MAX7219 display driver to adjust the brightness of the seven segment LED displays. 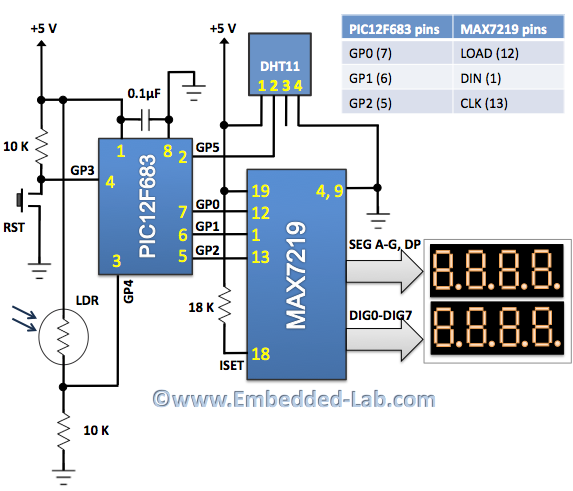 The MAX7219 chip provides a serial interface to drive 7-segment LED displays (common-cathode type) up to 8 digits and requires only 3 I/O pins from microcontroller. Included on the chip are a BCD decoder, multiplex scan circuitry, segment and digit drivers, and an 8×8 static RAM to store the digit values. The segment current for all LEDs is set through only one external resistor connected between the ISET pin and power supply. 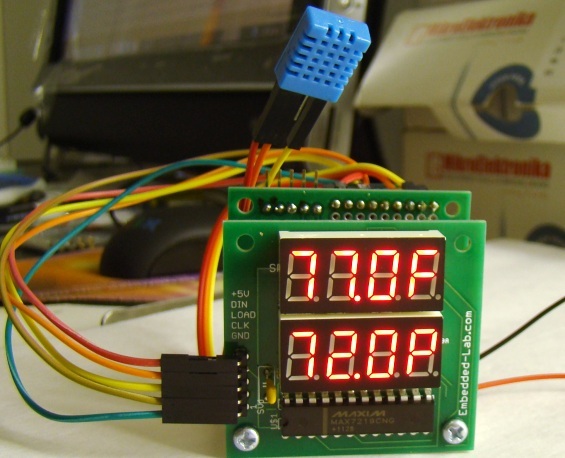 However, the device also provides a digital control of the display brightness (16 steps from minimum to maximum) through an internal pulse-width modulator. 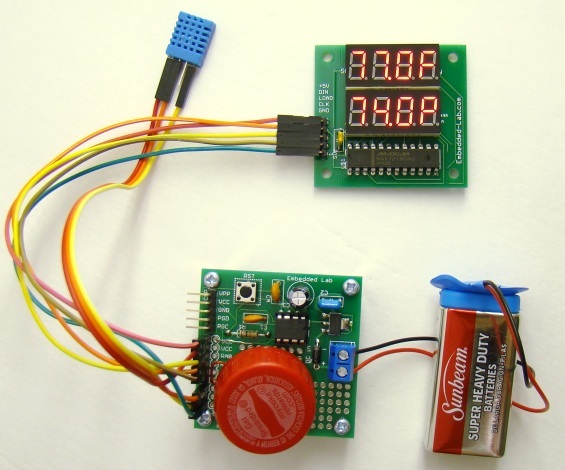 To learn more about the MAX7219 device, read my previous article Serial 4-digit seven-segment LED display. In this project, the GP0, GP1, and GP2 I/O pins of PIC12F683 are used to drive LOAD, DIN, and CLK signal lines of the MAX7219. In order to measure the temperature and relative humidity, the DHT11 sensor is used. It can measure temperature from 0-50 °C with an accuracy of ±2°C and relative humidity ranging from 20-95% with an accuracy of ±5%. The sensor provides fully calibrated digital outputs for the two measurements. 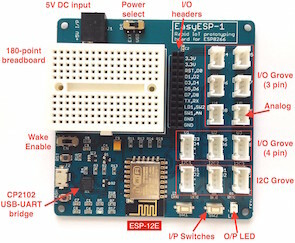 It has got its own proprietary 1-wire protocol, and therefore, the communication between the sensor and a microcontroller is not possible through a direct interface with any of its peripherals. The protocol must be implemented in the firmware of the MCU with precise timing calculations required by the sensor. 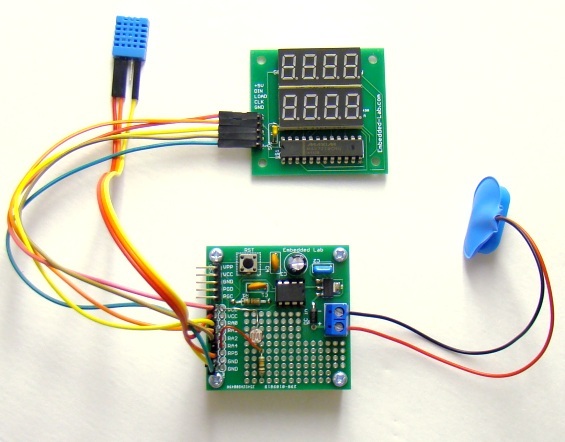 I have described more about this sensor and its communication protocol in Measurement of temperature and relative humidity using DHT11 sensor and PIC microcontroller. The PIC12F683 uses the GP5 I/O pin to communicate with the DHT11. To make prototyping easier, I am using my PIC12F Project board and my Serial 8-digit seven segment LED display in this project. The firmware for this project is written in C and compiled with mikroC Pro for PIC compiler version 5.30. The subroutines for initializing the MAX7219 and sending display-digit bytes are written in a simple and understandable way so that they can be easily implemented with any other programming language. 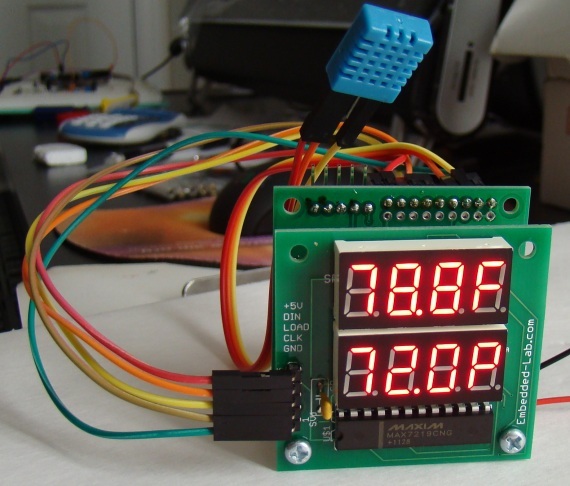 If you are not familiar with MAX7219’s internal control and display registers, I would recommend to read one of my earlier posts, Serial 4-digit seven-segment LED display. The MAX7219 allows display brightness to be controlled through software by an internal pulse-width modulator (PWM). The PWM output is controlled by the lower nibble (D3-D0) of the intensity register (address 0x0A) and allows 16 brightness levels. The zero nibble value sets the display intensity to minimum, whereas all nibble bits set to 1 selects the maximum intensity level for the display. For auto-brightness control, the ADC output of the LDR sensor is first scaled down to 0-10 (11 brightness levels) by simply dividing the 10-bit ADC count by 100. Then a look-up table is used to map the scaled brightness levels to appropriate nibble values for the intensity control register of the MAX7219. The temperature is displayed in Fahrenheit (F) scale and the relative humidity in percentage (P). The PIC12F683 microcontroller runs at 4.0 MHz internal clock. The MCLR and Power-On Timer are both enabled. 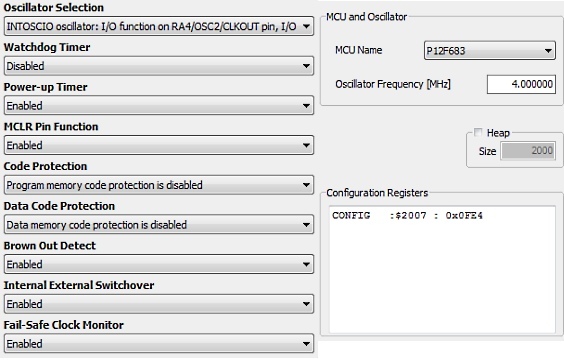 The complete configuration bit settings are shown below. The project was tested under different lighting conditions, varying from very dark to very bright, and all the time display was found readable and eye-soothing. If you want to put something like this in your bedroom, you don’t have to worry about turning it off during nighttime. The display will automatically dim enough so as not to disturb your sleep. While the given look-up table for brightness intensity provides satisfactory adjustment of brightness level at different lighting condition, you can still tweak these numbers to find the best matches for your eyes. Lo simulo con Proteus y no funciona, agradecería ayuda. Really like this project with HEX for Celsius.I started by controllers. I do not know how to write programs.Thank you! Can not get the hex to run. It lods but wont run in the circuit. Is there some thing I need to do to the file to get it to work. would love help thank you. can you help me by k type thermocouple interface circuit to microcontroller. i am making a project on automatic irrigation system using pic microcontroller using humidity sensors. i need help regarding which microcontroller to be used and coding to interface humidity sensors and solenoid valves.